When movies are filmed in Bastrop County, there's a hum of exciting gossip in the air—what movie are they filming, which actors are starring in the film, do they need extras? But keeping true to small town Texas, we keep it pretty laid back, too. We let the stars be normal folks like us, we don't mob the sets, and we make accommodations for the cast and crew. That's probably what keeps them coming back! 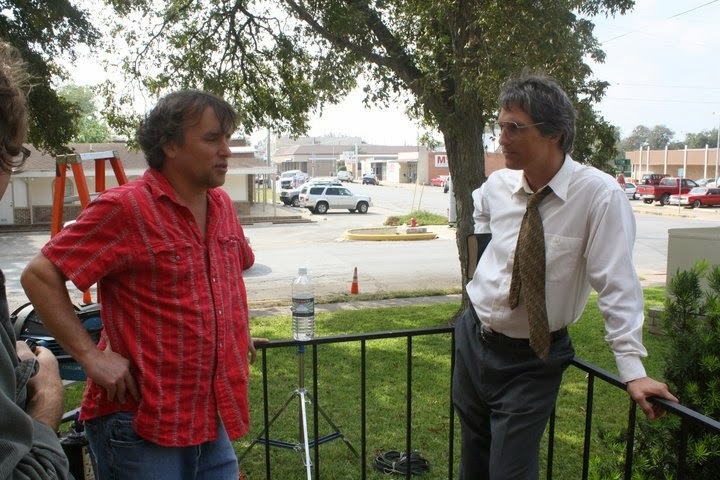 Richard Linklater & Matthew McConaughey on the set of "Bernie"
Speaking of coming back... one of our favorite directors, Richard Linklater—known for "Dazed and Confused," "Slacker," "Boyhood," and "Bernie"—is back in Bastrop filming his new movie "That's What I'm Talking About." According to an article by The Hollywood Reporter, the film, set in 1980, is based on Linklater's life and "follows freshmen as they navigate through the first year of college life, while trying to make the baseball team." Linklater describes the movie as the "spiritual sequel to 'Dazed and Confused.'" The film stars Blake Jenner, Tyler Hoechlin, Wyatt Russell, Zoey Deutch, Ryan Guzman, and Glen Powell. Some recent tweets claim actors Matthew McConaughey and Zac Efron (both of whom have previously starred in other Linklater films) have been seen on set. However, neither actor is listed on the film's IMDb page, so I guess we'll just have to wait and see if they make any cameos! Wyatt Russell on the set of "That's What I'm Talking About"
This week, the movie is being filmed in Bastrop at Fayette and Cedar Streets near Mina Elementary School. The movie is being filmed through Nov. 29th in Bastrop and surrounding areas including Elgin, Taylor, Weimar, San Marcos, Austin, and San Antonio. Several casting calls for extras have been posted by Project Casting, including their newest casting call for paid extras here. If you have any information or photos, please email info@365bastrop.com.